The North American Wild Turkey lives in North America. It is the heaviest and the biggest Galliformes. 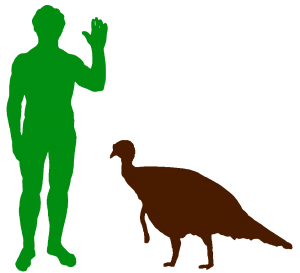 It is the same species as the domestic turkey. Domestic or tame turkeys were domesticated from the South Mexican Subspecies of the wild turkey. The domestic turkeys are the ones which are normally served by American people on Thanksgiving and Christmas. They are reared in farms. Adult wild turkeys have long reddish yellow to greyish green legs and a black body. Males are called toms or gobblers. They will puff up their bodies and spread their tail feathers like a beautiful peacock. They have a large featherless, reddish head, red throat and red wattles on the throat and neck. The wattle is a flap of skin. Their head has fleshy growths called caruncles. These will turn red when the turkey is upset. 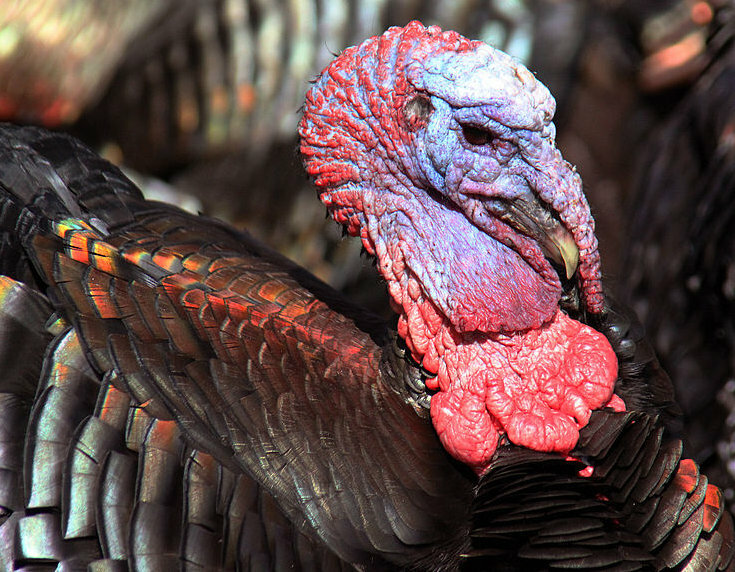 when a male turkey is excited, its head turns blue and when it is ready to fight, it turns red. It’s such an amazing colorful bird! Each of its feet has 3 toes and the males have a special weapon called a spur behind each of their legs. It is used during a fight. The long fleshy object over a males’ beak is called a snood. The snood will turn bright red when it is upset. Wild turkeys have a long dark, fan-shaped tail and glossy bronze wings. The males’ feathers have all kinds of colours. There are places which are red, purple, green, copper, bronze and some parts even look like gold at certain angles. A female turkey is called a hen. They are less brightly coloured. They are normally brown and grey. Turkeys have 5000 to 6000 feathers. Adult turkeys have tail feathers of the same length, but the young ones will have different lengths of tail feathers. Males turkey tend to have a “beard”, a tuft or coarse of hair growing from the centre of their breast. The beards are about 230mm (8inches) in length. The funny thing is some of the females have a beard too, but theirs are usually shorter and thinner. The adult male weighs between 5 to 11kg (11-24lbs) and measures between 100 – 125cm(39-49in). The adult female is much smaller. She is between 3-5.4kg (6.6-12lbs) and measures between 76 to 95cm in length. Their wingspan ranges between 1.25 to 1.44m (49-57in). Although they are heavy, they are good fliers – not like the domestic turkeys which cannot fly. They will fly or run if they smell danger. They live in the woods in North America. They make all kinds of sounds like gobbles, clucks, putts, purrs, yelps, cutts, whines, cackles and kee-kees. Wild turkeys are omnivorous. They will spend their days hunting for food like acorns, seeds, small insects and wild berries. They look for food on the ground and small trees. Sometimes, they end up eating amphibians and small reptiles like lizards and snakes. They spend their nights on the low branches of trees. The female will look for a good place to build her nest. She will tend to build her nest under a bush in the woods. She will lay between 10-14 speckled brown eggs. She will normally only lay one per day. The eggs are incubated for at least 28 days. When the babies are hatched, they are known as poults. The poults are covered with fine feathers and they are capable of moving when they are just hatched. So, they do leave the nest shortly after hatching, in about 12 to 24 hours. For the first two weeks the poults are unable to fly. Raccoons, Striped Skunks, Gray Foxes and Rat Snakes loves eating their eggs. Predators of both adults and young include Coyotes, Bobcats, Golden Eagles and Dogs. We humans are now the main predator of adult wild turkeys. The population of North American Wild Turkeys decreased at the beginning of the 20th century due to hunting and habitat loss. However, efforts have been put in to protect and encourage the breeding of the surviving North American Wild Turkeys.